This hand colored map is a steel plate engraving, dating to 1813 by the important English mapmaker John Thomson. It is an early and historically important representation of the continent of Africa. Much of the continent is simply labeled 'unknown parts,' but some regions are surprisingly detailed. Caravan routes, temples, and even the distances between Oases are noted. Across the center of the continent Thomson details the mythical mountain range known as the 'Mountains of the Moon.' The Mountains of the Moon were first postulated by Ptolemy to be the source of the Nile in the 2nd Century AD. This mysterious range remained on maps until the mid 19th century explorations of Burton, Speke, and Livingstone. Today it is generally agreed that references to the Mountains of the Moon refer to the Ruwenzori Range of Kenya & Uganda. This mountain range remains one of the most remote and exotic places on Earth, and is the home of a diversity of bizarre plant and animal life. Even so, it is not, as postulated, the source of the Nile which lies just to the south in Lake Victoria. Neither Lake Victoria nor Lake Tanganyika appear on this map. Thomson maps are known for their stunning color, awe inspiring size, and magnificent detail. Thomson's work, including this map, represents some of the finest cartographic art of the 19th century. John Menzies (fl. c. 1792 – 1851) was a Scottish engraver active in Edinburgh during the late 18th and early 19th centuries. Menzies mastered engraving as an apprentice to James Rymer. In 1811 he partnered with a younger relative, George Menzies, to found the firm of J. and G. Mezies, which was active until about 1831. Later his son, also named John, joined the firm and they engraved jointed under the imprint of J. Menzies and Son. At its height the Menzies firm employed three men and three apprentices. Menzies engraved maps for Thomas Brown and John Thomson, among others. After his death, he son, John Menzies II (1819 – 1891), continued the family business until about 1891. Very good condition. Original centerfold. Minor offsetting. Some minor creasing on the left side of the map - see image. Rumsey 1007.051 (1817 edition). 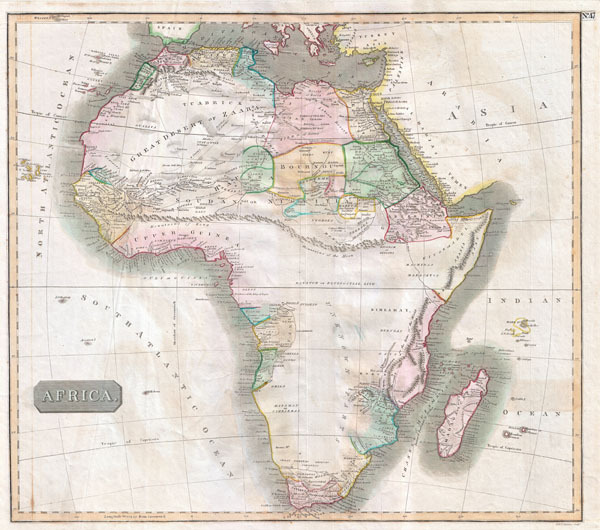 Tooley, R.V., Maps of Africa, p. 101 (1817 edition).